Grand Central Life & Style, 9781455542208, 288pp. The cookbook that Top Chef fans have been waiting for, from the celebrated judge who makes delicious food and inspired cooking accessible for home cooks. Gail Simmons is a beloved figure in the food world who has been a popular judge on Top Chef, the number-one rated food show on cable television since its inception. 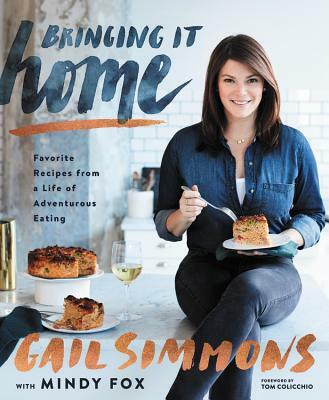 In Bringing It Home, Simmons shares her best recipes and food experiences. From her travels, exploring global flavors and keeping detailed diaries, to her Top Chef culinary adventures with the world's most notable chefs, she is always asking: "How can I bring this dish home to my own kitchen?" Her goal is to make fabulous recipes using accessible ingredients and smart, simple cooking techniques for successful family meals and easy entertaining. From Bloody Mary Eggs to Christmas Brisket Fried Rice; from Summer Vegetable Salad with Charred Lime Vinaigrette to Banana-Cardamom Upside Down Cake with Salty Caramel, there is a recipe for everyone in the family. Simmons also shares ingredient tips, cooking techniques, and many informative "Snippets," as well as personal and behind-the-scenes stories that will appeal to fans and food lovers everywhere. Gail Simmons is a trained culinary expert, the special projects director at Food & Wine, and a judge on Bravo's Emmy-winning series Top Chef since its inception in 2006. Simmons makes frequent television appearances on Today, Good Morning America, The Chew, and The Talk, and has been featured in New York magazine, Travel + Leisure, GQ, and People, among others. Her first book, a memoir titled Talking with My Mouth Full: My Life as a Professional Eater, was published in 2012. She lives in Brooklyn with her husband and daughter. Mindy Fox is a writer, editor, producer, and former restaurant cook, who has authored and co-authored many cookbooks, including Salads: Beyond the Bowl and The Perfectly Roasted Chicken. A former editor at Saveur and La Cucina Italiana, her work has also appeared in Food & Wine, Fine Cooking, In Style, Epicurious, The London Times, and more. She lives in New York City.